The value of awarded contracts recaptured the loss in momentum that was witnessed during the third quarter to reach SR61.9 billion ($16.5 billion). The fourth quarter surge resulted in the total value of awarded contracts to settle at SR220.8 billion ($58.81 billion) in 2014. 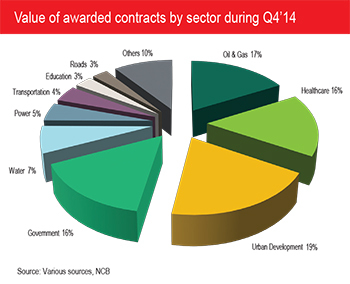 Although the value of contract awards fell by 25 per cent compared to 2013, 2014 still registered a strong performance. The main contributing sectors were oil and gas (SR48 billion), power (SR33 billion) and transportation (SR20 billion). During Q4 of 2014, the main contributors were urban development (SR12 billion) oil and gas (SR11 billion) and healthcare (SR10 billion). October’s SR45.4 billion represented the highest value of awarded contracts during 2014. The healthcare and oil and gas sectors were the largest contributors. Two significant contracts were awarded in the healthcare sector by the Ministry of Health totalling SR10.3 billion ($2.74 billion) to the joint venture of Bawani Company and Salini Impregilo. Within the oil and gas sector, two contracts were awarded by Saudi Aramco worth SR8.6 billion ($2.29 billion). In November, the water sector garnered the largest share of awarded contracts worth SR3.6 billion ($958 million) on two contracts. Both contracts were awarded by the National Water Company (NWC). The oil and gas sector contributed two contracts awards worth approximately SR2.3 billion ($612 million) that were awarded by Saudi Aramco to Abdulrahman M Al Shalawi Establishment for the Khurais increment programme. In December, the urban development sector had SR4.9 billion ($1.30 billion) worth of awarded contracts. The bulk of these contracts were related to the development of urban areas by improving flood and drainage networks, landscap-ing, lighting and other electrical work.